Review by AllTheBestFights.com: 2018-02-24, nice and tough fight between Srisaket Sor Rungvisai and Juan Francisco Estrada: it gets three stars. The Wbc super-Flw champion Srisaket Sor Rungvisai (also known as Wisaksil Wangek) entered this fight with a record of 44-4-1 (40 KOs=91%) and he is ranked as the No.1 super flyweight in the world. He suffered his last loss when he faced Carlos Cuadras in 2014 (Rungvisai vs Cuadras), since then he has won 16 consecutive bouts defeating Roman Gonzalez twice in 2017 (4-stars fight, Gonzalez vs Rungvisai I and Srisaket Sor Rungvisai vs Roman Gonzalez II). His opponent, the former Wbo and Wba Flw champion Juan Francisco Estrada, has an official boxing record of 36-2-0 (25 knockouts) and he entered as the No.5 in the same weight class. ‘El Gallo’ suffered his last loss when he faced ‘Chocolatito’ Gonzalez in 2012 (Gonzalez vs Estrada), since then he has collected ten consecutive victories beating Anuar Salas (Estrada vs Salas) and Carlos Cuadras in 2017 (Carlos Cuadras vs Juan Francisco Estrada). 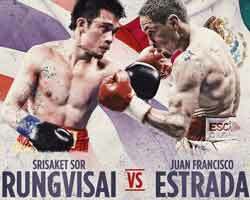 Rungvisai vs Estrada is valid for the WBC World super flyweight title (Rungvisai’s second defense). Watch the video and rate this fight!